Being a mother is a wonderful experience. However, being responsible and responsive to the needs of your little one is no easy task. But even among the diaper changes, feedings, and those occasional clothing related accidents, mothers should remember being a mother does not mean you need to limit your movements. In today’s post, we will look at baby bags (backpack style) to hold and safeguard your little treasure’s treasures. From backpacks that consider the mother’s ergonomics to unisex bags for daddys to help out, we will explore the world of baby backpacks, allowing to explore the world with your baby!! Leaving the house is frightening for a new mother. Do I have enough diapers? Will the formula remain warm? With innovations and inventions in this field, baby bags have evolved, and we are sure you can find a baby backpack that will fit your needs. So, let’s look at which factors we need to consider before we purchase. The point of having a backpack is for the ease and comfort of the bag on your back. 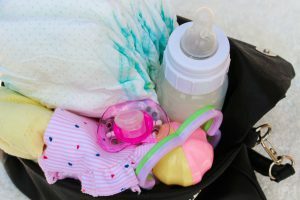 But if you need to take off your baby backpack every time you need to reach a bib or pacifier, it will hinder your movements, especially when you are in a hurry. We strongly recommend looking at the exterior. If the baby backpack has a zipper, you can retrieve items by just taking off one shoulder strap, therefore, half-wearing your backpack. Also, look on the backside of the baby backpack. If there are inserts or pockets, you can place valuables like your smartphone, wallet, keys, etc. In addition to the ease to retrieve, these items sandwiched between your back and the backpack is a good anti-theft measure. As a mother, you need to carry an array of different items, which at times will be heavy. 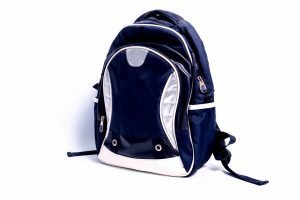 The weight of the bag backpack falls mainly on the shoulders, which can cause the shoulders to ache at times. If there is padding on the shoulder straps, the padding will ease the pressure of the weight the shoulder needs to bear. Likewise, a back cushion can bear the bag’s weight as well. Look for ergonomic features to help relieve the weight away from your body, especially shoulders. This is an especially important point for women who already suffer from shoulder or back pain. Also, mothers who need to carry many baby-related items on a regular basis should consider this factor strongly. Raising a child is a job for both the mother and father. There are times when daddy and the baby go out on their own or you leave the house together as a family. Often, in the cases listed above, daddy will carry the bulk of the items. If the baby backpack is a neutral color and a standard style, both mommy and daddy can share the same backpack like they share in the child-raising responsibility. In addition to being multi-functional, baby backpacks nowadays have become a fashionable item as well. Therefore, please do take into account the appearance of the baby backpack during selection. Our recommendation is for simple colors such as black, gray, navy and khaki as well as bags with a solid or small, simple pattern for dual parent use. A baby backpack increases its values by the number and types of storage spaces. Therefore, we recommend looking at the special features of these spaces as well as the accessories included as a purchasing point to consider. There are special features such as insulated baby bottle inserts or wet clothes compartment for accidents infants may encounter on their day out. In addition, baby stroller hooks or a diaper changing mat are accessories which are convenient and thus welcomed as accessories included with the purchase of the baby backpack. When viewing different bags, compare and contrast these features. It may help narrow down your choices according to your needs, your lifestyle! After looking at the purchasing points to consider, we need to examine the actual baby backpacks. And so, the following are the Top 10 baby backpacks based on the factors above. Enjoy! This patterned pockets on the solid background are definitely for the cool moms in the playground. With red zipper trimming off-setting the black exterior, this baby backpack can be very well used as a regular backpack when the baby is older. Containing standard side pockets as well as a front zippered pouch for easy access to items such as bibs or pacifiers, this is a baby backpack first. The interior is large, with separately insulated baby bottle holders as well as a separate elastic pocket to separate items. There is a wall zipper pocket as well to store items you want to keep zipped up such as wallet or keys. 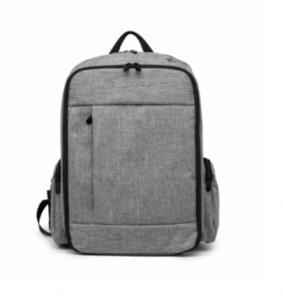 Though there is no mention of the padding in the shoulder straps and the design cause some apprehension among the daddies, it is a reasonably priced, cool, basic baby backpack. A fashionable baby backpack, available in orange, blue or gray, the simple solid pattern makes this baby bag suitable for both mommy and daddy. The interior space is large. There are 4 inserts to store items as well as a zippered wall pocket to store valuables as well. The waterproof exterior is easy to wipe if your child should dribble or have any other sort of accident. There are two side pockets to store items for easy access and the large zippered front pocket can store up to 3 baby bottles. This baby backpack has a handle in addition to shoulder straps, allowing the mom (or dad) to carry the baby backpack by the handle when necessary. The design is very cute and would suit mothers who are concerned about having a fashionable baby backpack. Depending on the color, it could be unisex as well. Though reasonably priced, there are no insulated pockets, accessories, nor padding for carrying-ease in this product. Available in red, blue, brown, and purple, this polka-dotted, multi-pocketed bag’s shape is different from other baby backpacks. 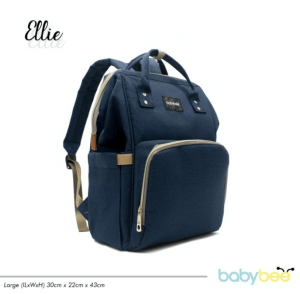 With a large handle, singular long shoulder strap as well as two backpack-shoulder straps, mothers are given the choice of using the baby bag as a satchel, shoulder bag or backpack. On the exterior, there are two insulated side pockets to keep the baby formula warm. 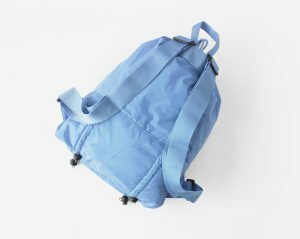 Instead of the usual semi-circle zippered front pocket, this bag has two rectangular pockets on the front of the backpack. The interior is large as well, allowing various sized items to be stored. Though the comfort of cushioned shoulder pads or accessories is not included, the versatility and design of this product are points to consider for people interested in a unique baby backpack. A very cute, shape-transforming baby bag, this bag can be used as a backpack or the mother can hold the handles like she would with a tote bag or satchel. The only accessories included are clips to secure the bag to the baby stroller. Though the accessories may be limited, the thought in the design is not. The front pocket, zippered, can hold 3 bottles in its own individually insulated pouches, which is important if your baby is constantly fussing for a bottle. Within the large interior, there are 4 wall pockets as well as a zipper wall pocket to store valuables. The interior is water resistant as well and contains a key clip. Available in mint green, gray, red and black, this reasonably priced baby backpack is one to keep your eyes on! Available in an array of 5 colors of white, pink, purple, blue and navy, mothers can decide which color suits their lifestyle. In the interior, there are two large separate inserts for big items like iPads/laptop/clothes. The remaining insert can be used to store two baby bottles. The exterior’s front and side pockets are cushioned, insulated and zippered, assuring temperature control, comfort and stability of the items stored. 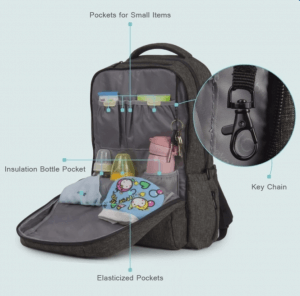 A diaper changing mat, baby stroller straps and a separate wet diaper bag are among the accessories included in this baby backpack. This backpack is aiming to function as both a baby backpack while the baby is still young but can eventually be used as a gym bag or travel bag when the child becomes bigger and doesn’t require as many items. A versatile baby backpack, for now, this item can become an item changing its purpose as time passes. Made from a waterproof, flax oxford cloth, neither the product nor the price is cheap. 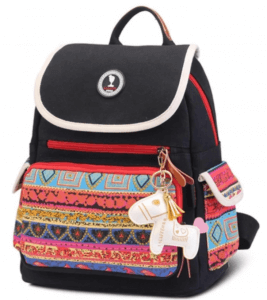 However, having 18 storage pockets in addition to the main zippered storage area, the price may be worth all the features of this baby backpack. The interior contains insulated pockets which are useful for items like baby formula. There are also small pockets for cutlery or other small items. Elastic pockets which stretch can hold diapers or other not so small items. The various sized pockets allow mothers to store a variety of items in different sizes. A keychain to secure your key is included as well. The exterior includes two side pockets as well as a separate zippered front pocket. The back has a secure, hidden insert as well. The back also contains a back cushion for ease in carrying the many items a baby needs in addition to the padded shoulder straps. Being unisex in design and color, if only the price were more reasonable…. But even at its current price, many do think it is a good value. Though a little on the pricier side, this multi-compartment baby backpack is worth its high price according to its purchasers. The available colors are green and light gray, making this a unisex item. And the padded shoulder pads allow ease in carrying the various items babies require. For the exterior, there are two side pockets in addition to three front pockets, varying in size. There is a hidden zippered pocket as well to store valuables in an anti-theft measure. The large loop on the top can be hooked onto straps of a baby stroller. For the interior, it is large with inserts again of different sizes, so baby bottles, towels, diapers can be stored separately. The waterproof interior allows dry items to be separated from wet clothes. The number of accessories included with this baby backpack is remarkable. The built-in baby wipe holder, diaper changing mat, and two bags make most mommies feel they are getting their money’s worth. And we must agree, though the price is high, the accessories, attention to details, etc., do make the high price seem more reasonable. This solid color, simple baby backpack is popular among its purchasers for its high quality, reasonable price and special features. 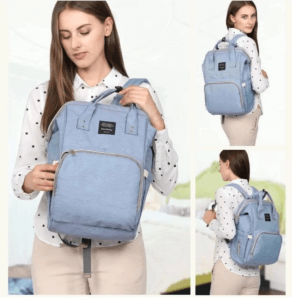 Available in four colors of navy, gray, blue and peach, the array of color allows the purchaser to decide whether this item is mommy-specific or unisex baby backpack. The exterior is easy to wipe, as we know babies often dribble or spit up when they do not intend to. The side pockets can be used to store baby wipes for easy access. The large front zippered pocket can hold other quickly needed items such as a rattle or pacifier. And the price is not bad, either. Purchasers of this product rave about the large storage area with insulated inserts for baby bottles. There is a special waterproof zippered compartment on the exterior for wet clothes, which is quite useful as well. And a hidden zippered pocket to store your keys is a great anti-theft measure. 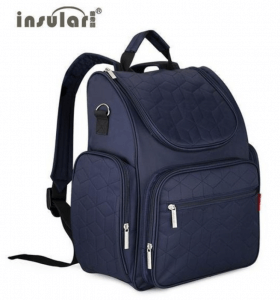 The low cost combined with the baby backpack fulfilling the basic requirements of a baby backpack gives this product a high-cost performance value. Though not perfect, the low price, special features and basic functions make this product a very good purchase option. This nylon baby backpack is both practical and comfortable for mothers to use. The comfortable sponge-like padding in the shoulder straps and back provides a cushion for the mommy, absorbing the weight of the necessities her child requires. 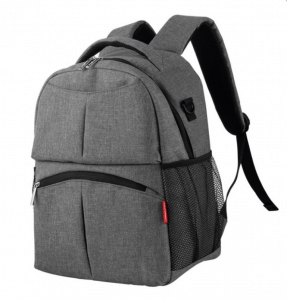 A plain, but functional gray baby backpack can be used by either mommy or daddy on a baby’s day out. The interior of the bag has large storage capabilities with individual pocket and inserts on the interior, allowing separated storing of diapers, baby bottle, etc. The exterior is simple with a large front pocket, large enough to store an iPad. Side pockets are available as well for ease in reaching items that do not need to be zipped up. The specialness of this bag, actually, is in its accessories. Thinking of the users, items mother may purchase on their own are included. Among them, a diaper changing mat, stroller straps and storage bag for wet items. The practical functions of this reasonably priced baby backpack, combined with the thoughtful accessories earn the Elegant home-MY Mummy Maternity Backpack high marks in this ranking. With a large storage space, filled with many pockets and inserts, the Yummy Mummy-YLF-10054 is a popular item. Made from a waterproof material, neither rain nor your child’s dribble will ruin this sturdy item. The baby backpacks are available in grey, black, red and purple, in a simple gender freestyle. The S-shape padded shoulder straps add an ergonomic design concept to relieve the weight off of the shoulder. There is a supporting back cushion as well which is great news for mothers who suffer from body pain or those who need to use the baby backpack regularly. There are plenty of pockets on the inside and outside of this baby backpack. The pockets are positioned to allow ease in accessing necessary items. In addition, there is an invisible pocket on the top to place valuables. The hidden pocket factor is great for anti-theft as there are times when it is difficult to keep control of your belongings and your baby. The special features of this baby backpack include, but are not limited to insulated baby bottle pockets, straps for the baby pram and so on. Being a versatile bag, there is a slot for a laptop as well (9.7” iPad, etc. ), which allows items other than baby items to be stored. Today we explored the world of baby backpacks to allow you to explore the world with your baby. Though it is frightening to confirm no items are left behind as you venture off with your little one, by having a good baby backpack, you and your baby are given more freedom. Good luck and enjoy exploring! !